I’ve been sitting on this recipe for a couple of months now, which is a shame because this recipe is important. It was the recipe that sealed my street cred with the preschool staff. On the last day of school when I waltzed in with an Avon box lid full of these babies, everyone overlooked the poor plating to drool over the cupcakes’ beautiful deliciousness. As I gingerly handed the lid over to the secretary she told me the words I’d been waiting to hear all year, “The ladies just love everything you make. They’ll be so excited to see these!” Then I took a bow and hung up my apron because my work was done. Or at least that’s how the dramatic narrator in my head told it. Really, I was nervous. I’d made so many changes and substitutions from the original recipe and hadn’t had a chance to taste anything because I was literally piping cupcakes five minutes before school ended. Blushing, I nervously accepted all the praise, consoling myself with the fact that I wouldn’t see any of these people for at least an entire year and if the cupcakes were that bad our daughter could just forgo preschool altogether. When I got home I sunk my teeth into one of the extras and breathed a deep, deep sigh of relief. The cupcakes really did deserve all the praise. My only complaint about them is they are a tad bit messy to eat, but really I suppose that only adds to the indulgent experience. For the Cupcakes: Preheat the oven to 350° F. Line cupcake pans with 24 cupcake liners. Whisk together the flour, baking powder, and salt in a bowl; set aside. Either with a stand mixer fitted with a whisk attachment or a regular bowl and a hand mixer, beat the egg whites on medium speed until foamy. Add the cream of tartar and increase the speed to medium-high. Beat just until stiff peaks form when the beater is lifted. Set the egg whites aside. In a new bowl (or newly cleaned if you’re me and only have one bowl for your stand mixer) beat the coconut oil on medium speed until smooth. Gradually add the sugar and beat until incorporated. Mix in the lemon zest. Beat the mixture on medium-high speed until light and fluffy. Beat in ¼ cup of the milk until just blended. Reduce the speed to low and add the flour mixture alternately with the remaining milk, scraping down the sides of the bowl as necessary. Beat until just blended. Using a rubber spatula, fold one quarter of the egg whites into the batter, being careful not to deflate the mixture. Once incorporated, add in the rest of the whites (including any liquid that may have accumulated) and gently fold in until well combined. No visible white streaks should remain. Divide the batter between the cupcake liners, filling each about 2/3 full. Bake until golden and a toothpick inserted in the center comes out clean, about 18-22 minutes. Cool the cupcakes in the pan for about 5 minutes, then remove them from the pans and cool completely on a wire rack. For the Raspberry Curd: While the cupcakes are baking, melt the butter in a large saucepan over medium heat. Add the raspberries, egg yolks, sugar and salt, and cook, mashing the berries. Stir frequently at first and then constantly at the end, until thickened (one test is to see if it sticks to the back of a spoon), about 10 minutes. Pour the mixture through a fine mesh sieve set over a bowl, pressing hard on the solids to extract as much liquid as possible. Cool to room temperature. The curd will continue to thicken as it cools. Stir in lemon juice to taste. Cover and refrigerate until fully chilled. For the Frosting: Beat the butter and zest on medium speed until light and fluffy. Gradually add the sugar and beat until smooth. Add the heavy cream and lemon juice and beat one minute longer until light and fluffy. Assembly: Once the cupcakes have cooled, hollow out the center of each cupcake. There are special tools for this, but I generally just use my vegetable peeler to scoop out a nice hole. 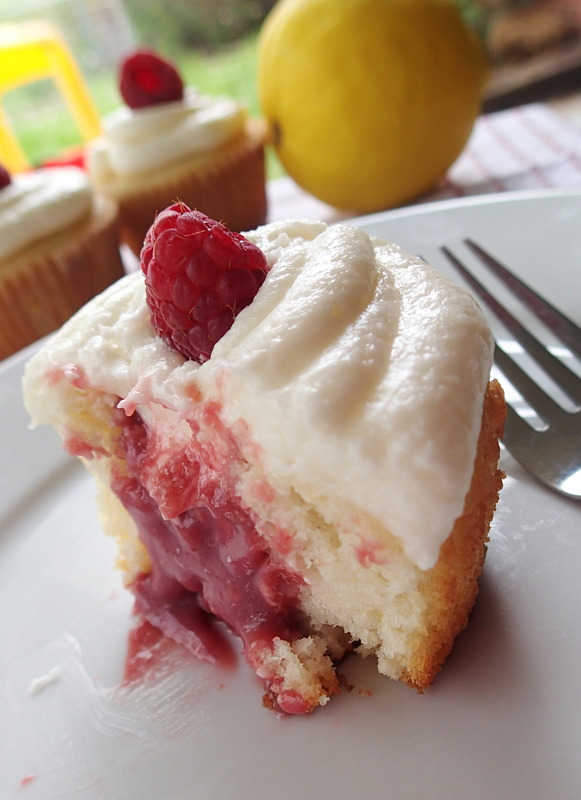 Be sure to not “dig” too deep or too wide, you want the curd to stay in the middle of the cupcake. Spoon a couple of teaspoons of the filling into the cupcakes. 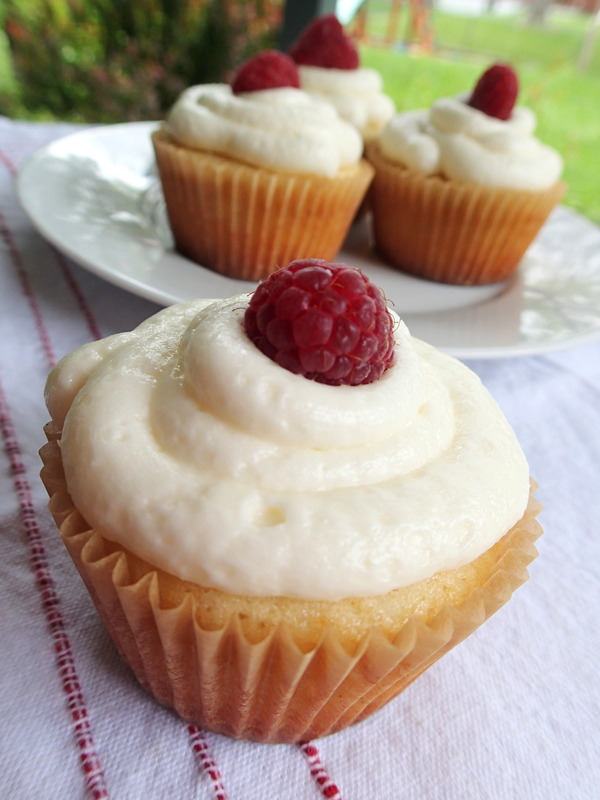 The filling should sit just shy of the top of the cupcake. Frost as desired. Garnish with fresh raspberries. How much butter do you need for the cupcakes? I am not seeing a butter amount for cupcakes. Only for raspberry curd, and buttercream. I used coconut oil in the cupcake batter instead of butter. (I noticed I said butter in the instructions instead of coconut oil and changed it.) You can sub butter straight across for the coconut oil though if you don’t have any on hand.